I honestly didn't even know what I had captured until I was viewing my photos on the laptop. Even then, I must admit I scrolled past the photo, and then thought "Wait a minute..." and went back to it. Then, when I confirmed what I had thought I saw, I was quite pleased. I showed it to one of my best buds to see if he saw what I saw, and he immediately went crazy over the photo and started telling me how great it is. What it is... is LUCKY! It is a beautiful capture, Misty! I have never seen a Bobolink, hopefully someday! What a great photo...that Bobolink is really focusing on that bee. A one in a million shot, I think. Great capture of the bird and the bee. 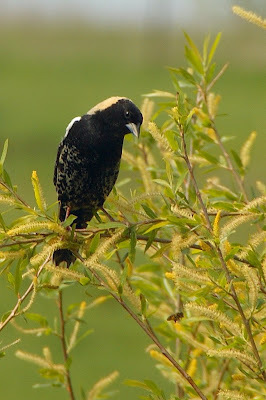 Bobolink.... I learned something new today. Great photo. He looks like he is solving the world's problems-- or at least reflecting on them! It's a beautiful bird, with or without the bee! Great pic! I think he looks very serious also, maybe he is thinking, Lunch? Congrats...that is a very good capture! Actually, the quizzical look on it's face makes me think "Inquiring Minds Wanna Know" for a caption/title. Beautiful shot, Misty. He certainly has his eye on the bee. Lovely contrast and color. Well done! That is a great capture, Misty! I enlarged the photo to be able to see that was a bee. I love the pose of the bird. I have some photos of a squirrel and a cat in our tree on my post this week. What a beautiful bird! You captured it wonderfully. A beautiful photo, Misty. He definitely has spied his brunch! Misty: What a neat bird/bee photo. I think you should call it "I See You". That's a real nice picture of Bobolink. We only see them over here in the autumn in drabber plumage when they get lost over the Atlantic and end up in the Scilly Isles usually. Great photo. The bird is definitely tuned into to the bee. Brunch is about to happen. Wow! This is a wonderful capture! Love everything about this photo, Misty! The bird is so striking! I see it: lunch is flying by! Fabulous shot! Whatever you call it, it's a great photo! Wow! I'd say that bee is flying near danger. Amazing shot! ...just dropping by..i'm practically new with this thing so i'm kinda blog hopping. And pretty site you got here!..i'll follow you..Have a great day!